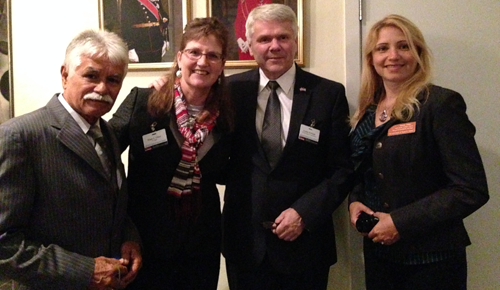 Petronio Nuñez, Hilary Olson, Norway's Consul General Jostein Mykletun, and Vanessa Nuñez at the Consul General's residence. November 4-6, 2013: CSLF Side Meeting. Ramon Trevino and Katherine Romanak hosted a side-meeting during the Carbon Sequestration Leadership Forum's Ministerial to discuss an international collaboration on subsea CO2 geological sequestration. Topics included barriers to offshore GS implementation; advantages of sharing experience, cost, risk and technology; scaling-up issues; and variability in feasibility in different countries. Washington, DC. Katherine Romanak, front row, second from left, participated in CCS for CDM workshop. 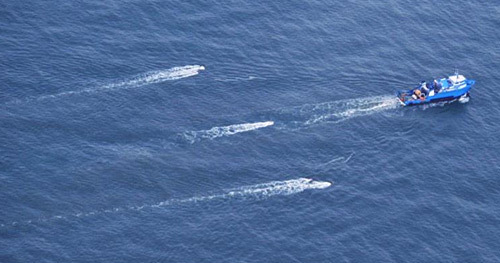 October 2013: New High-Resolution Seismic Survey in Gulf of Mexico. A second 3D seismic survey using the new P-Cable acquisition system was successfully completed during ten days of data collection off the Texas coast in October. The system, which includes dense data collection from 12 streamers and 96 channels, is designed to provide extremely high-resolution 3D data for relatively shallow stratigraphic depths (<1500 m). The BEG is the only research institution in the United States currently operating such a P-Cable seismic acquisition system. GCCC's Tip Meckel led the survey and Ramon Trevino led the logistical coordination from shore. Participants included BEG's Dallas Dunlap, Nathan Bangs from the Institute for Geophysics, and Ben Phrampus, a graduate student from SMU. 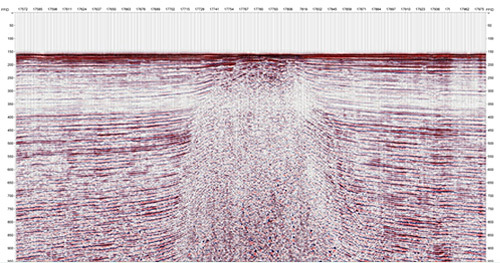 A single-channel field record from the recent survey shows a salt dome approaching the seafloor in the center part of the survey. During the October cruise over 400 line-km were shot in an area offshore southern Galveston Island adjacent to and including portions of the San Luis Pass shallow salt dome. The survey imaged subsurface stratigraphy and structure above a Miocene-age CO2 storage prospect at ~2,000 m depth. The data will be analyzed to understand geologic seal and fluid systems. Interest from industry in a subsea carbon storage repository has been building, and acquiring datasets such as those collected using the P-cable system are important for developing a variety of commercial applications of high-resolution 3D technologies. The survey was performed from the R/V Brooks McCall based out of Freeport, TX, and operated by TDI-Brooks International, Inc. of College Station. NCS Subsea provided navigation support. The research cruise was funded through DOE-NETL's carbon sequestration research program and the Texas General Land Office as part of a multi-year effort to characterize potential CO2 storage sites in the near-offshore Gulf of Mexico. BEG's first P-Cable survey in the San Luis Pass region was completed in July 2012. Data processing of both surveys is ongoing and one more GOM acquisition survey is planned for 2014. Read more reporting on the survey. Learn about the BEG's first P-Cable acquisition cruise. A special section of the October issue of the International Journal of Greenhouse Gas Control is dedicated to CCS work at Cranfield Field, Mississippi. The section comprises a mid-project overview and assessment of the CCS field work, dense data collection, and analysis that began a decade ago with the formation of the Southeast Regional Carbon Sequestration Partnership and that continues today at Cranfield Field. The section consists of sixteen papers authored by GCCC staff and their colleagues. It opens with a discussion of the Cranfield project design and covers risk assessment, characterization, injection and production activities, as well as monitoring techniques and modeling. The publication of this collection of papers is a gratifying milestone for the GCCC. The volume was guest-edited by Susan Hovorka, Tip Meckel and JP Nicot. Nicot commented, "This is the first exhaustive document of the Partnership's projects, and it will be useful to the entire CCS community." Seunghee Kim, Seyyed Hosseini, and Tim Dixon discuss using geodesy for CO2 monitoring. Ph.D. candidate Kit Caruthers from Scotland is working with GCCC staff on aspects of his research investigating natural analogs. 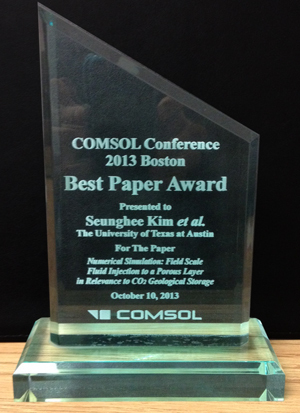 GCCC Post Doc Seunghee Kim presented award-winning work on CCS. 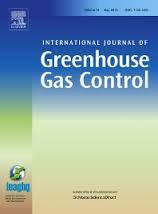 October 1, 2013: "Greensites and brownsites: Implications for CO2 sequestration characterization, risk assessment, and monitoring" was authored by Brad Wolaver, Susan Hovorka, and Becky Smyth and published in the International Journal of Greenhouse Gas Control. The paper characterizes differences between sites lacking previous subsurface development, or greensites, and sites where the subsurface has been developed, or brownsites, as they pertain to CO2 injection for storage and for EOR. Greensites are typically more stable, and thus a simpler environment for characterization and monitoring, while at brownsites legacy infrastructure and contamination must be evaluated so that leakage signals are not mimicked or masked. These differences should be recognized in policies and regulations. 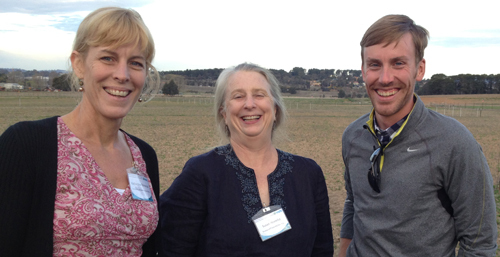 Katherine Romanak, Sue Hovorka, and Sean Porse visit the Ginninderra controlled release site during the IEAGHG meeting. Ramon Treviño leads a group of high school students on a tour of the core facility at BEG. 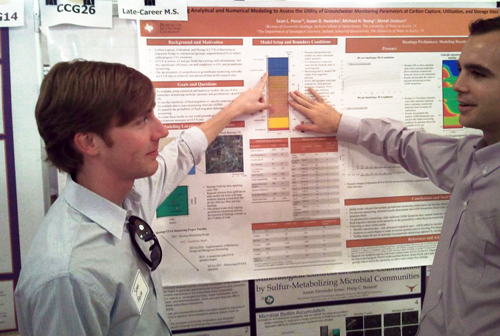 July 7, 2013: The West Texas Geological Society (WTGS) awarded the John Emery Adams Scholarship in the amount of $2000 to MS candidate Logan West. WTGS writes that through this scholarship they are delighted to continue to support and promote the geosciences at the University of Texas at Austin. Congratulations to Logan! July 2, 2013: Accolades for GCCC from the American Association of Petroleum Geologists Division of Environmental Geosciences! At the AAPG Annual Convention and Exhibition in May, Tip Meckel presented, "Determining Seal Effectiveness and Potential Buoyant Fluid Migration Pathways using Shallow High-resolution 3D Seimic Imaging: Application for CO2 Storage Assessment on the Inner Texas Shelf." This oral presentation was selected as the Bernold M. "Bruno" Hanson DEG Excellence of Presentation award (best paper). The poster Marlo Gawey presented, "Experimental Analysis and Modeling of PFT and SF6 Transport in Organic Rich Vadose Zones: Implications for Monitoring CO2 Leakage at CCS Sites" was selected as the as one of the two Division of Environmental Geosciences Best Poster Awards. Both awards will be presented in a special ceremony during the DEG luncheon at the 2014 AAPG Annual Convention April 2014 in Houston, Texas. Congratulations to our winners! June 24-28, 2013: Repetitive Pulse Monitoring Approach Tested. 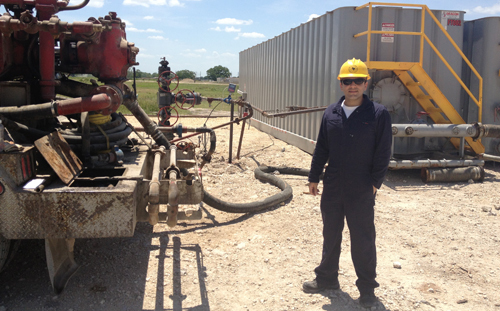 Seyyed Hosseini designed and tested a novel approach for monitoring the CO2 presence in above zone monitoring intervals in a Gulf Coast region CO2-EOR oil field south of Houston. This approach is based on repetitive pulse testing between two or more wells perforated in the monitoring sands to assess the change in compressibility of the formation over the time, a sign of possible CO2 leakage from deeper zones. June 24-26, 2013: American Geophysical Union's Science Policy Conference Sean Porse presented "Using Analytical and Numerical Modeling to Assess Groundwater Monitoring Parameters at Carbon Capture, Utilization, and Storage Sites." 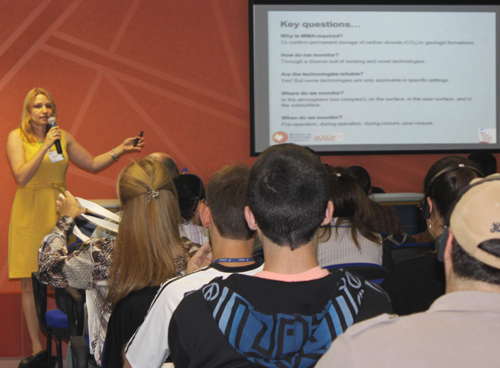 Workshop sessions focused on three major topics: Energy, Hazards, and the Arctic. The conference was an opportunity for Porse to present his own research and to collaborate with scientists from a broad range of backgrounds including government and academia, as well as with congressional representatives and staff. Washington D.C.
June 5, 2013: CCUS Conference Presentation Winner! Participants in the 12th Annual Conference on Carbon Capture Utilization & Sequestration held in Pittsburgh in May were asked to vote for presentations that they felt were the "most ground breaking, innovative and insightful." Many outstanding presentations were submitted, but the winner was Katherine Romanak for her talk, "Protocol for Response to Claims of CO2 Leakage: Case Study at the Kerr Farm, Weyburn-Midale Oilfield." She claims an iPad for her outstanding work. Congratulations, Katherine! 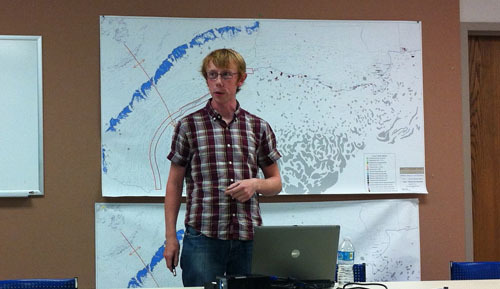 April 9, 2013: Tip Meckel presented an overview of CCS to an undergraduate course in UT's Petroleum Systems and Geoengineering program. A link to the video is here. 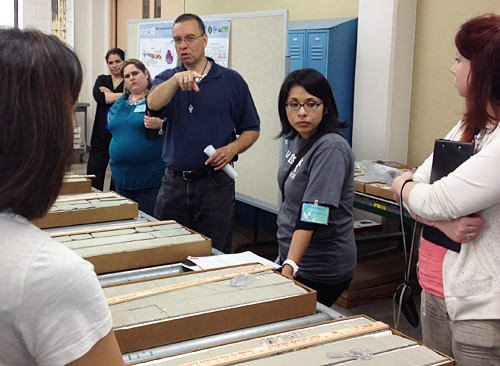 April 5, 2013: South Central Section of the Geological Society of America Half-day Workshop for Educators. Teachers from across the US joined GCCC staff at the Pickle Campus for a field trip "Carbon Capture and Geologic Storage: Global Research Centered in Texas." Activities included tour of the amine pilot plant capture facility. the core research center, and environmental monitoring lab. 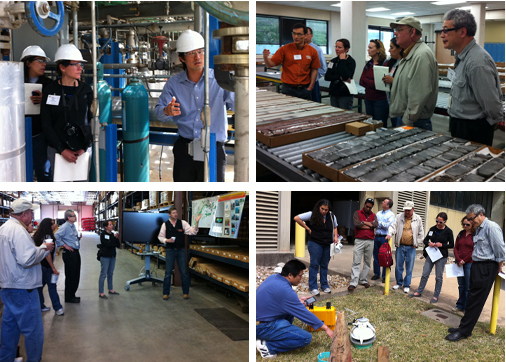 Discussion covered basics of CCS, subsea geologic storage and environmental monitoring. GCCC thanks Eric Chen, Tip Meckel, and Changbing Yang for providing fascinating and unique perspectives on CCS. Thanks also to Ramon Trevino and Zahid Kandakar, as well as CRC and Bureau support staff for making the field trip run so smoothly. Austin, TX. GCCC staff cover a variety of CCS topics during half-day field trip for educators attending GSA. Susan Hovorka provides a review of geologic storage sites. Very Susanto, nearest to screen, discusses possible tracers that could be used for monitoring with GCCC staff. March 4, 2013: 8th Annual SECARB Stakeholders Briefing. Changbing Yang presented results of groundwater monitoring at Cranfield and implications for other CCUS sites. www.secarbon.org Atlanta, Georgia. March 2, 2013: Explore UT. 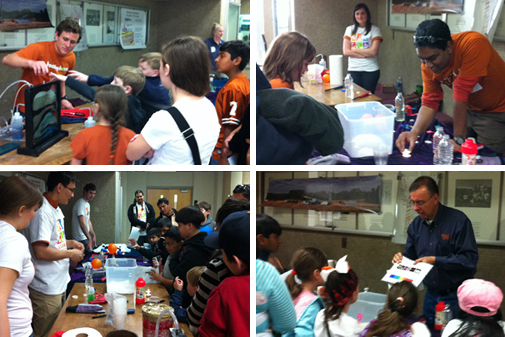 GCCC asked kids spending the day exploring The University of Texas at Austin to consider "What To Do with CO2: Cures for the Feverish Earth." Interactive activities presented by staff and students included building models of carbon dioxide, floating balloons on a bed of invisible carbon dioxide, and exploring a magnified model of reservoir pore space. Ramon Trevino, Jiemin Lu, Mary Hinst, Kerstan Wallace, Julie Ditkof, Wylie Walker, and Zahid Khandaker entertain and educate during Explore UT. February 19, 2013: Susan Hovorka and Tim Dixon have written a letter outlining the regulatory controls that limit risk of seismicity. February 3-6, 2013: Society for Petroleum Engineers Applied Technology Workshop "Carbon Capture and Storage - Emphasis on Offshore Carbonate Reservoirs." Tip Meckel led discussion "Broader MMV Issues in Carbonates." Ian Duncan led discussions: "Site Selection for CCS in Carbonate Reservoirs," "Seabed Sensors and Shallow Sub-surface Marine Monitoring," and "Risks for Offshore Pipelines." Penang, Malaysia. Sean Porse explains his research at the Jackson Student Symposium. 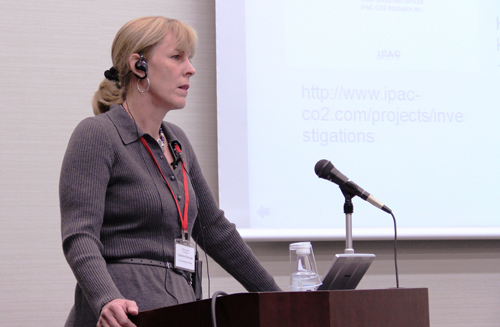 Katherine Romanak speaking at the RITE CCS workshop in Tokyo.